Georgia, Charlie and Alice each arrive at Harvard with hopeful visions of what the future will hold. But when, just before graduation, a classmate is found murdered on campus, they find themselves facing a cruel and unanticipated new reality. Moreover, a charismatic professor who has loomed large in their lives is suspected of the crime. Though his guilt or innocence remains uncertain, the unsettling questions raised by the case force the three friends to take a deeper look at their tangled relationship. Their bond has been defined by the secrets they’ve kept from one another—Charlie’s love and Alice’s envy, Georgia’s mysterious affair—and over the course of the next decade, as they grapple with the challenges of adulthood and witness the unraveling of a teacher's once-charmed life, they must reckon with their own deceits and shortcomings, each desperately in search of answers and the chance to be forgiven. 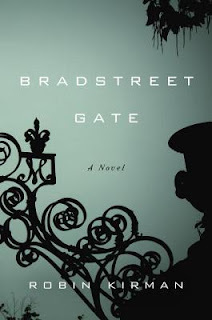 A relentless, incisive, and keenly intelligent novel about promise, disappointment, and the often tenuous bonds of friendship, Bradstreet Gate is the auspicious debut of a tremendously talented new writer. I went into this novel thinking it was a murder mystery. Spoiler alert! It’s really not. This novel is more of a walk through the four main character’s lives. The reader gets to know the three main students and the professor and what makes them tick. Charlie is a go getter who never really fit in with his family. Alice is a young woman who never really fit in anywhere and is very insecure. Georgia is a wanderer who is looking for a place to fit in, and Storrow is a harsh and orderly figure who has unrealistic expectations for everyone. Throughout the novel, you get to know the characters well, but you don’t really ever like any of them... at least I didn’t. I kept reading and kept reading, hoping to learn more about the murder and thinking that there would be some finalization to the story. We follow the characters from their childhood to their adult life with no real understanding of how they fit together other than they have relationships in college, but they still keep enormous secrets from one another. If you are looking for a murder mystery, this book is not for you. If you are looking for a book about spoiled friendships and wishy-washy endings… give it a try. I thought the writing was excellent and easy to read, but the story was not for me.